Jim Westphalen’s solo exhibition “The Enduring Landscape” will be on view for the month of June with an opening reception on Friday, June 7th from 5-7pm at our Gallery On The Green. 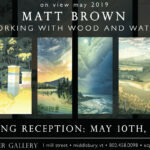 For additional information on this event, please visit the gallery, or call – 802.989.7419. To view Westphalen’s available work, please click here.